My book club read (or at least some of us did) Supercapitalism and we met at Stix to dine and discuss. None of us had ever eaten here before. I had dined at the restaurant, Bambara, that formerly occuppied the space a couple of times and gave it mixed reviews. Stix is owned and operated by the same folks who ran Bambara and 33 Restaurant (which is nextdoor). To be honest with you, when I originally heard about Stix right around when they opened (Fall of 2007 ) I thought it sounded like an interesting place that I would like to try. Their “shtick” is that they have a selection of small plates that feature various things served on flavor-infused wooden skewers. But then…. I started hearing bad word-of-mouth reviews, and reading mediocre or bad reviews on Chowhound and Yelp. I went to my book club dinner with an empty stomach and an open mind. The decor at Stix is modern and trendy, but nothing that bowled me over. The space is long and narrow. One wall is lined by a bar that had a cool color-changing light wall behind it. The tables ran the length of the room on the opposite wall. There is supposedly a lounge area downstairs, but I didn’t check it out. The walls are exposed brick with blonde wood panels that match the tables. We all ordered one or two small plates each. I ordered the tuna sashimi ginger mango Stix ($9)and the pickled shitake potstickers ($9). The Stix came out first. There were 3 skewers of tuna sashimi with soy sauce for dipping. The tuna was coated with togarashi (red chili peppers), wasabi, and tobiko (fish roe). I found the tuna to be WAY to salty. If the tuna was infused with any of the ginger mango flavor from the sticks it was completely masked by the saltiness. One of my fellow diners also got the tuna and felt that they were too salty. The Shitake Potstickers were the best part of the meal for me. The wonton wrappers were filled with chopped shitake mushrooms, topped with scallions and served with a ginger dipping sauce. The wontons were flavorful and thankfully didn’t have the salt overload that the tuna had. A couple of my fellow book clubbers ordered the mini lobster tacos. When they were brought out to the table, I had a moment of envy and thought “I wish that I ordered those!”. They were so cute and looked to be little tasty bites. Turned out that I had nothing to be jealous about. The lobster tacos were bland, bland, bland. We were the only party in the restaurant for about the first 40 minutes of our meal, which even in these times of economic downturn was a bit odd. At least we had the $10 off coupon from their website. (Our waitress told us that there was a $25 off coupon available on restaurant.com). We all left hungry, but firm in the knowledge that our book club will not be returning to Stix. Firefly Bistro is one of those places that I keep wishing was better than it was. It has all the right ingredients for a place that could be so promising: really close to the T, a nice sized patio, affordable prices, cute decor, relatively quiet dining space. But, I often find myself disappointed with the food. This past weekend my friend was in town from Malaysia and I met up with her at the Copley mall. She is on a budget for her trip and wanted someplace affordable and close to the mall. We ended up at Firefly Bistro since a few of her favorites from when she was last in town 9+ years ago had since closed. I’ve had dinner at Firefly 4 or 5 times before, mostly for book club meetings or group gatherings. My experiences there have been pretty mixed but overall veering towards “meh”. 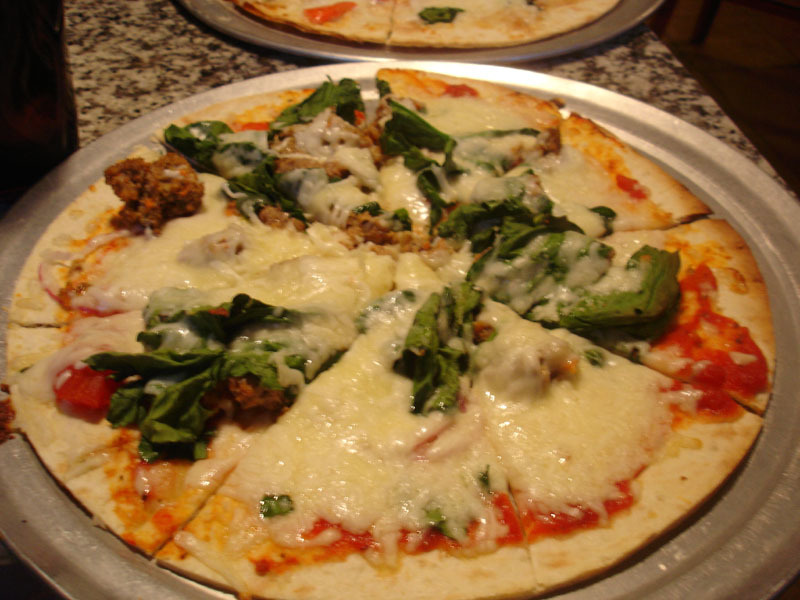 On this visit the Meatloaf & Spinach pizza caught my eye. It made me longingly think of a meatball and spinach pizza that a now closed pizza place near my house used to make– I loved that pizza. sigh. The Firefly version…not so much. It had a really thin crust which oddly wasn’t very crispy. It was sort of floppy, like a piece of lightly toasted lavash bread. The cheese was practically congealed and tasted weird. The only saving grace of the pizza, in my opinion, were the chunks of meatloaf.